Today is a bittersweet photo that I snapped yesterday at my favorite little indie bookstore here in St. Louis: All On The Same Page Bookstore, owned and operated by Robin and Dennis Tidwell. Sadly, the bookstore is going out of business. I first visited the bookstore two years ago on its opening day to write a review about it for a blog I ran at the time devoted to St. Louis bookstores. My plan was to visit every bookstore in the St. Louis area and write a review about them. I closed the blog down back around the time that Borders Books went under because updating the blog with all the store closures was too depressing. One of the perks to my reviews was that I would report on the customer service level of the stores: I would only buy something at the store if an employee spoke to me. You’d be surprised at the number of stores, mostly the big retail chains, where no one even said hello. I never had that problem at All On The Same Bookstore though. Prior to my visit, I had emailed Robin to let her know I was coming. Being an author, I also came armed with books in hand hoping to coax Robin into carrying my books in her store. You might think that sounds funny but it’s a very true statement. For years, there has been a harsh line drawn between bookstores and independent authors like myself, and there are several reasons. Indie books have a bad reputation for being poorly edited or for having book covers that look like they were drawn by first graders. And just because you published a book, suddenly you have this chip on your shoulder and think you are a celebrity so you approach the store with an attitude. It’s nice to see that this line is quickly depleting. Authors are dropping the attitude, and so are bookstores. Authors are investing in editing services and good book covers to improve the quality of their work, myself included. 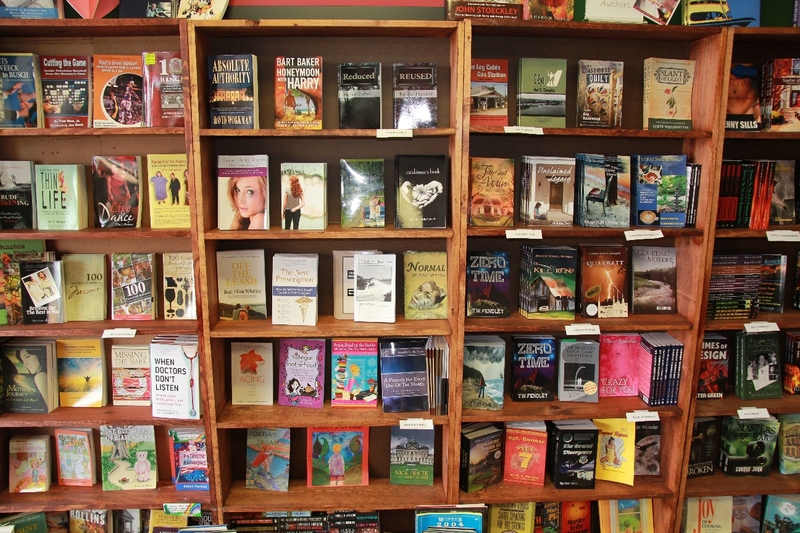 And small community bookstores, like Robin’s, are becoming community melting pots for local authors. Robin Tidwell and AOTSP quickly became THE front runners of St. Louis bookstores when it came to giving indie authors a chance. AOTSP hosted indie author book signings practically every weekend for as long as I can remember – I went to several of them (that’s why I was there yesterday), and I even held three signings of my own there. The first three or four book shelves (top to bottom) right by the front door were even devoted to some 150 or 200+ local authors. 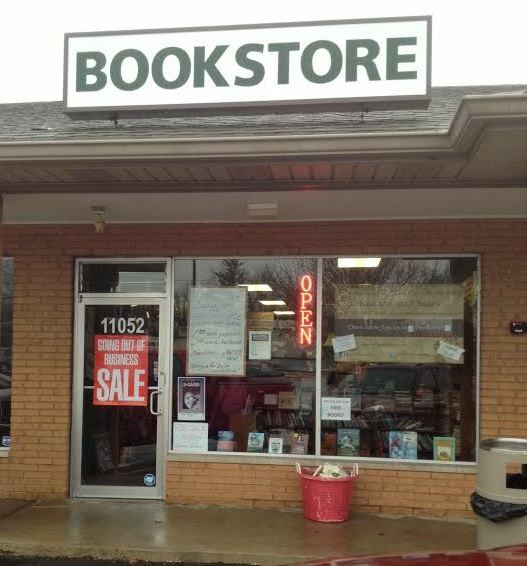 AOTSP was the first and only bookstore to carry all four of my books on the shelf at one time. The indie author section at AOTSP: my books are on the right, second shelf from the top. I also became involved in a small writers’ group which Robin formed and hosted at the store. It started with just 3 of us: Robin, myself, and one other. But quickly grew to as many as 10 people at one meeting. We met and chatted about our work or the industry. Some people read their work in progress, myself included, to get feedback. I met and made some wonderful friends from this group and owe that much to the bookstore as well. I could go on and on about the dying industry of books, but I won’t. It’s been happening for a long time, and will probably continue to happen as technology improves and our attention spans don’t. For now, I’ll just say good-bye to my beloved little bookstore. All On The Same Page was the little bookstore that could. It became the little bookstore that did. And I’m grateful to have witnessed that. Time to turn the page. Reblogged this on Slippers, or Stilettos?. Shannon Yarbrough’s eloquent tribute to All on the Same Page Bookstore. Sorry to see a good store go. I too am sad to know that AOTSP is closing. Robin has been wonderful to the local authors, and we have become friends. She has been awesome!